Recently I’ve been reflecting on embedding continued learning once the development centres, team-days and workshops have been completed. Everyone seems to want workshops and programmes that are quick and snappy, leaving no time for establishing continued learning and development: that piece of work is ‘done’ and the focus shifts to the next project on the list. As learning and development professionals, we continue to search for the ‘Holy Grail’ of our profession: proving that learning has actually resulted from our intervention and finding ways to encourage our learners. Of course, there are no simple solutions and in my view it’s foolish to look forward before we look back, so I want to go ‘back to basics’ and apply a traditional model: the Systematic Approach to Training, alongside a&dc’s design principles, to suggest how we might do things differently, with the ultimate aim of doing them better. We must establish the purpose of whatever it is we are commissioned to work on. If we don’t know this, then we shouldn’t really go any further in the design process, otherwise how do we stand a chance of ensuring that learning can be embedded or sustained? The question ‘why’ is worth repeating (and repeating! ), until this is crystal clear; quickly followed up by the ‘what’. We also need to work hard at ensuring that we have a robust set of learning aims and outcomes in place before we get anywhere near to choosing methodologies. When well written, they offer us the best chance of all of finding that Holy Grail. If stage 3 is easy, providing you get stages 1 and 2 right, stage 4 is a bit trickier. There’s so much that is likely unknown (e.g. preferred learning styles of your participants), so you need to make sensible assumptions and also be guided by all those constraints, like how long your participants can be ‘present’ for and whether you have the opportunity for face-to-face contact. There are some very obvious methodologies that give us the best chance of success, usually those that require our learners to DO something; to practice skills and to apply what we are helping them to learn, to their ‘real’ world. 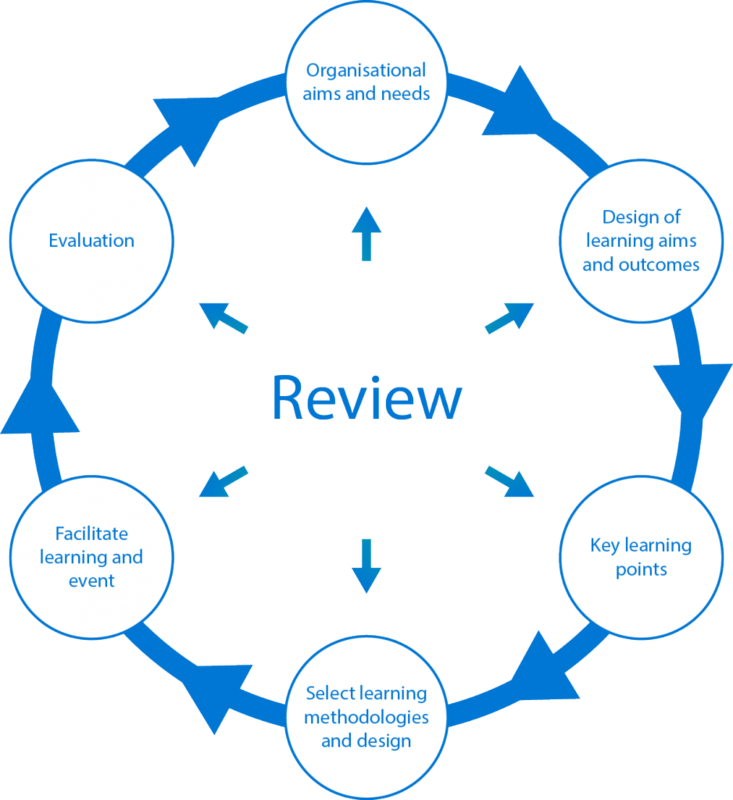 Review and evaluation should happen throughout the training cycle and in order to embed and sustain learning, post-intervention measures that engage both learners and line managers should be established, ensuring that these have been agreed beforehand: at the very beginning of the design process. Here at a&dc, we design an evaluation strategy which details how we intend to collect evidence against the agreed levels of our Greatest Certainty framework. 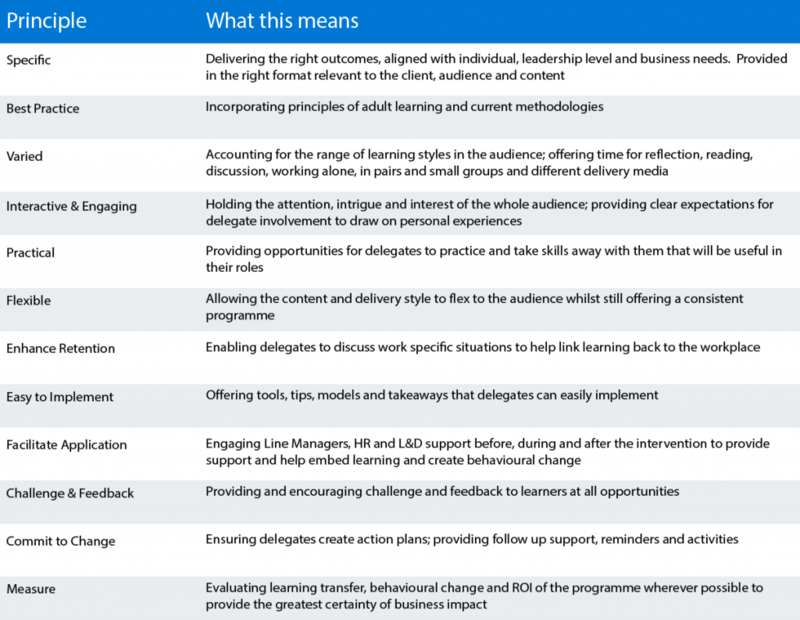 There are, of course, no short-cuts to sustaining and embedding learning and here I’ve summarised just a few of the things that we seek to do at the different stages of the training cycle. To ensure consistency and the best chances of success at a&dc, we have created a set of design and delivery principles which we work to. These are shared with our clients in proposals for new projects and are used as part of internal quality assurance checks once any intervention is designed. So, maybe there are no new answers to an old challenge, but in my experience, applying the basics of effective learning design, together with an effective working partnership with our clients, offers the best way of embedding and sustaining learning.